**PROMOTION NOW CLOSED** Thanks for entering! 1997 was the beginning of time for us and we haven’t stopped since. For 21 years, V has been livin’ large and energising NZ. To celebrate our 21st, it’s our shout! We’re going big, giving away a MASSIVE $100,000! This is our gift to you – our biggest fans. All you need to do is get any specially marked V – (here’s a clue – they’re the ones with the $ on the front where the V usually is) and text the code from your pack and boom! 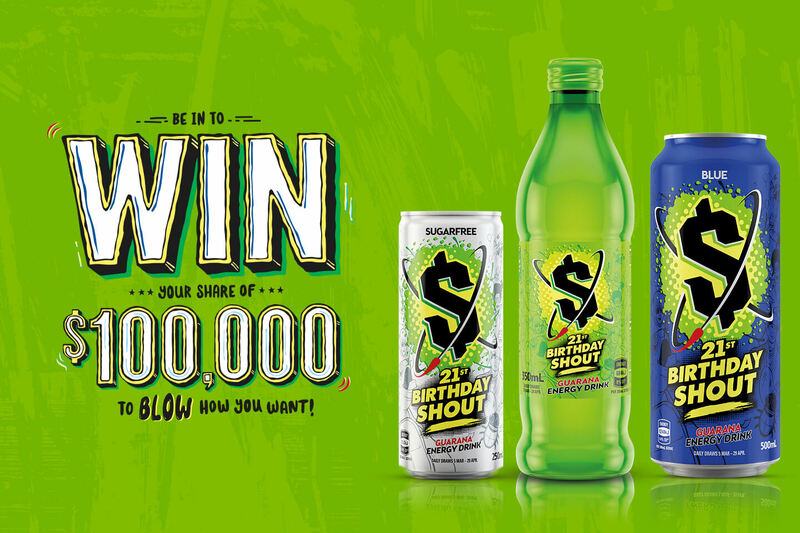 You’re in the draw to win a share of that cash money. We’re drawing 21 winners every day for 8 weeks. That’s right we’re giving away 21 cash prizes EVERY DAY! So go ahead grab your favourite V and raise a can, to the can full of can! Pro tip – just to keep you on your toes, we have included codes on some unmarked V Bling 500ml cans too – ssshh don’t tell anyone… (or tell everyone we don’t mind). Try our epic new flavour and you’ll be ahead of the game with another chance to win, and a new favourite flavour for your trouble. Wanna hear from V, and maybe win some stuff? Click here to register.